At precisely 9 a.m. and 36 seconds on April 1, The Bruery in Placentia launched a new brand. “IPA and cans are two words you’re not likely to associate with The Bruery…but today we’re introducing a third member to Famille Rue, Offshoot Beer Company.” Although it’s April Fools’ day, their well-thought-out logo, trademark symbol, and merchandise had me intrigued. This was either real or one of the most elaborate pranks of all time. On The Bruery’s 4/1/2017 tap list, three beers were available for pour under the new brand: Delayed Gratification Juicy East Coast IPA, Out of Context West Coast IPA, and Perjury Hazy Double IPA. Even with the three beers in hand, a full release schedule, and a warm and cuddly Patrick Rue grin, I still was cynical. “I think you’re still full of crap…we’ll see if Offshoot is a thing come April 2nd,” I said, sipping with my pinky out and a furrowed brow. “Oddly enough,” quips Patrick, “I was searching my email for “offshoot” a week ago and came across a message from 2007 from my wife where she used the word ‘offshoot’ in an old unpublished blog post (from Aug. 23, 2007, before The Bruery was open). She had just toured Mammoth Brewing’s canning line, noting, “while cans don’t fit The Bruery’s branding, maybe someday we can make an offshoot brand making hoppy IPA’s. The email was strange as we had never planned on that name and had 40 other names floating around, Offshoot is what stuck.” I listened to Patrick’s obvious rueuze, arms folded and nodding sarcastically. 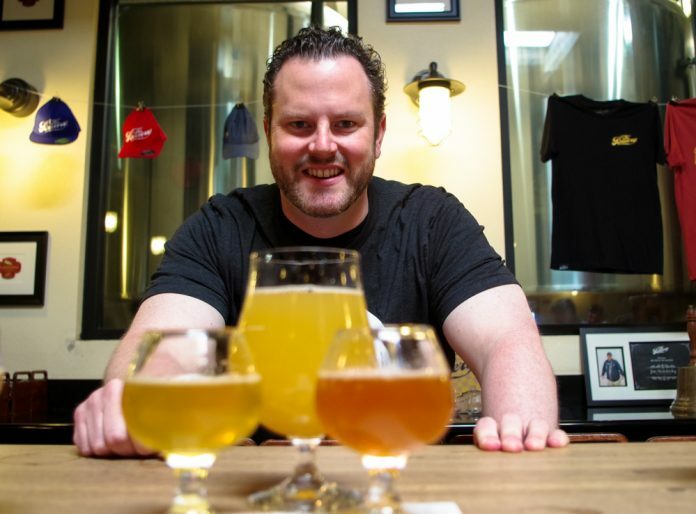 The Bruery’s pilot system, ran by homebrewer turned pro Andrew Bell, has been skirting around the IPA style for years, releasing draft-only IPA-esque beers inside the tasting rooms. As the owners vowed to never brew an IPA, their India Pale Lagers, hazy Vermont pale ales, and “highly-attenuated hoppy barleywines” (aka Double IPA), were seen as a sign of things to come. As The Bruery prides itself on not fitting into style molds, it’s somewhat odd to see the 9-year-old company fall in line with the basic, yet popular IPA, especially so late to the game. 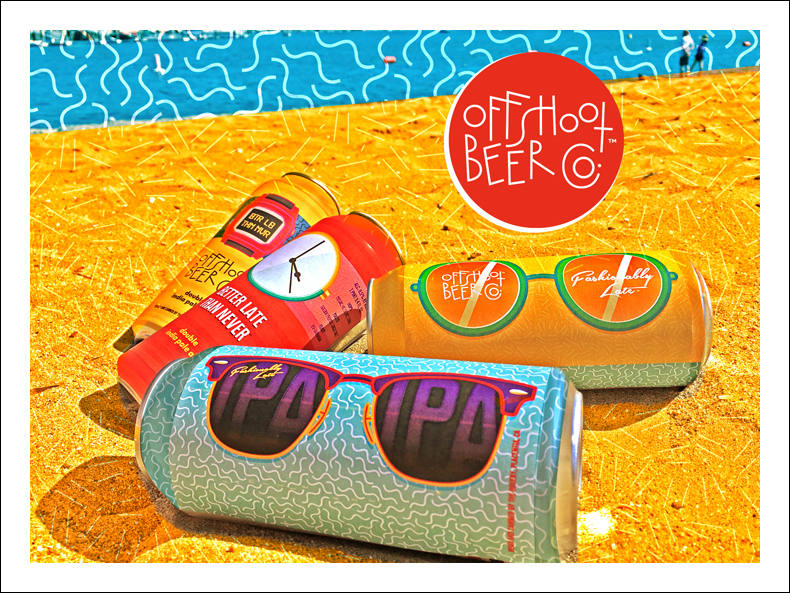 I hope Offshoot can bring something new to the table, as the hazy Instagram-bait cans of juicy beer are somewhat indistinguishable from one another, and the beer names are utterly forgettable. Don’t get me wrong, this style of beer can be tasty if executed properly, I just hope Offshoot brewer Andrew Bell can innovate within the style and birth something fresh. The Bruery has many tools at its disposal, with a dedicated quality control staff, 500 barrels worth of foedre space (large wooden fermentation vessels), and a library of yeast and bacteria to pull from. Hazy horse blanket brett fermented IPA, anyone? I might line up for that. BerlinerIPA with huge hop loads? Let’s see what they can do. In order to get in the know for Offshoot, one must sign up on their website. Reserve Society members get first dibs on cans, then it opens up to the public.